Cloth and garments in ancient Egypt were considered to be one of the most important components of a person’s life. Clothing was not only functional, but was symbolic of a person’s social position. Cloth was highly valued and appeared as a major feature in the list of tomb offerings. Cosmetics, jewelry and other accoutrements were not only ornamental, but were believed to have magical properties attached to them as well. This tour would examine transitions in ancient Egyptian fashion from the severe to the frivolous. Objects and images include shirts, dresses, sandals, mirrors, kohl tubes, razors, jewelry, wigs, and hair ornaments from the collection of Egyptian Art at the Metropolitan Museum. A highly ornamented ancient Egyptian coffin from the first century B.C. is the centerpiece of this exhibition. 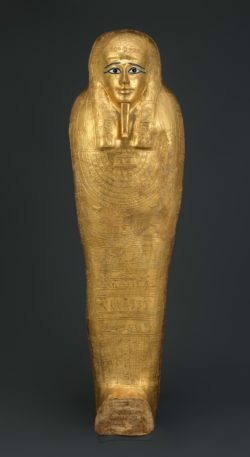 The recently acquired work, which was inscribed for a high-ranking priest of the ram-headed god Heryshef of Herakleopolis, is displayed with seventy other works, also from The Met collection, that provide contextual information about Nedjemankh’s role as a priest in ancient Egypt, his burial, and the decoration on the coffin.